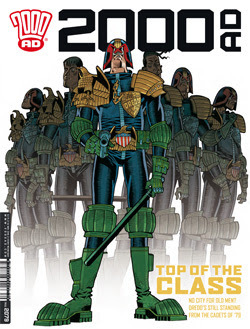 A new Dredd story with an old, un-busted foe for Dredd. It’s a ‘last ride’ type story, with the criminals going for a big score to help some friends. I like the set up and the way it’s going, so I’m looking forward to the chase in the next issue. On a side note, there are some good side gags too! The gun sharks are taken out of their comfort zone in this new arc as they go flying. Using AR, they are trying to assassinate a gang boss, but things don’t go to plan. I like the way there are now thought bubbles, and the classic Sinister Dexter humour. Combined with the art and a good story, this looks to be fun in an AR WWII! It looks like we’re close to the end in the Psi battle of vampires and Judges. What this is going to do with the Psi’s I don’t know, but it doesn’t look good. There is some good fighting here, and a lot going on too! That’s a fast moving story, with a ‘nicer’ ending! Well done, and pushing you in the right direction. The answers are all there before you get to the end, but it’s when you get to the end it all clicks! Kenton does well here, but is it enough. Kenton also gets all the action here, all Alpha gets is opening a door, but it’s a well done issue, with an interesting ending. Alpha’s visions don’t pull any punches do they! ?